Back in the spring, I devoted more words than anyone ever needed or wanted to read on the subject of baseball scorekeeping apps for the iPhone. That round-up included iScore Baseball Scorekeeper, a decent-if-overly-elaborate scorekeeping option that crammed a few too many features onto the iPhone’s screen for my liking. A lot has changed in the ensuing five months. The baseball season is winding down and my local nine are eliminated from the pennant race in spirit if not necessarily mathematically. iScore developer Faster Than Monkeys partnered with ESPN to rebrand the scorekeeping app. And, in a bit of news that probably escaped your attention, Apple released the iPad. It’s that development that’s caused me to re-evaluate my opinion of iScore. Because iScore’s developers rolled out an iPad-specific version of the app under the ESPN banner, and while it’s not all that different from the iPhone version in terms of features, ESPN iScore Baseball Scorekeeper for iPad offers users a dramatically different—and improved—experience for keeping tabs on ballgames. 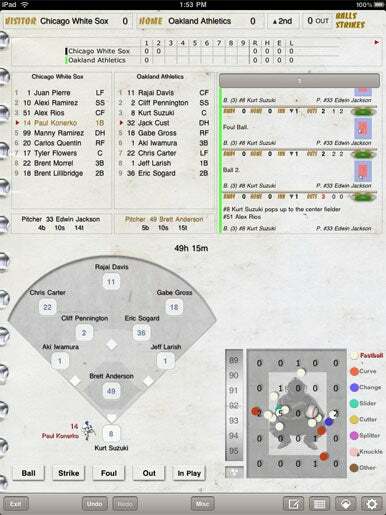 Can’t Tell the Players Without a Scorecard: iScore Baseball Scorekeeper uses the iPad’s larger screen to fit in a staggering amount of detail about the game you're tracking without making everything feel too cramped. iScore certainly makes good use of the extra screen space offered by the iPad. 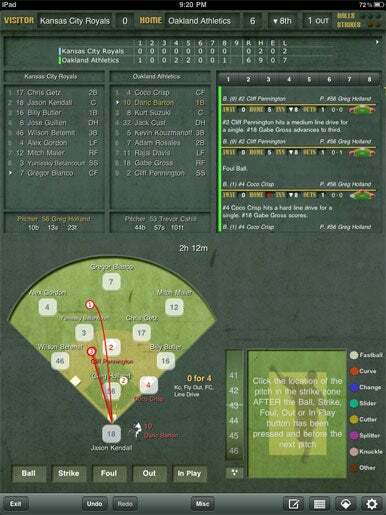 On a single screen, the app fits a line score, both teams’ lineups, a scrollable pitch-by-pitch play-by-play account, a pitch-tracking tool, a clock timing how long the game’s been going on, and a baseball diamond that can show you who’s playing what position, who’s on the basepaths, who’s at the plate, and what they’ve done in previous at bats. That’s a Ruthian amount of information to have at one’s fingertips, but it all fits quite naturally in iScore. Many of the same features that appeared in the iPhone version of iScore have made their way over to the iPad. The app generates a gorgeous scorebook page after each game and tracks cumulative stats. You can tweet game updates using iScore’s TwitterCast feature and even post pitch-by-pitch updates to the Web. New to both the iPad and iPhone versions since my last review is a feature that lets you track pitch speed and location if you’re that obsessed with recording every last detail of a game. The mechanics of scoring a baseball game are the same for iScore on the iPad as they were on the iPhone. You tap buttons—ball, strike, out, in play—to match the action on the field, and iScore assists you in filling in the details. Some of my complaints about the iPhone version of iScore—that it forces you to adapt a particular scorekeeping method—apply here. Recording a simple out takes a few more taps than I think it should, and while you don’t have to keep track of balls and strikes, that will throw off iScore’s pitch count feature. But again, the iPad’s extra screen space makes all this feel like less of an imposition. That’s not to say iScore gets every design element right on the iPad. I wish the Ball, Strike, Out, and In Play buttons were larger, considering how often you’re called on to tap them; the Ball button in particular is a little too close to the Exit button for those of us with clumsy fingers. And I would prefer it if you could disable features you didn’t use—I can’t imagine I would ever want to track pitch speed and location—and replace them with easy access to features you find more valuable. Day Games: An optional lighter skin makes it easy to see iScore’s details even when you’re using the app in sunlight. iScore does an admirable job with other details though. You may have read how the iPad’s reflective screen can be difficult to see in the noonday sun—a potential problem if you’re scoring baseball games played during the day. iScore cleverly gives you the option to switch from the app’s default dark background to a lighter, whiter view with dark text. That won’t stop your iPad from getting warm under the sun’s unforgiving glare, but it does make the screen easier to read. I’m still not convinced that an electronic approach to scoring baseball games beats a good ol’ pencil-and-paper solution. Using iScore to tally up a standard Major League Baseball game will eat up about 30 percent of your iPad’s battery life—a consideration you don’t have to take into account with a physical scorebook. And while sunscreen-stained fingers, the occasional rain delay, and mustard splatter from your bratwurst may leave your paper scorebook looking a little worse for the wear, those sorts of things could prove to be far more damaging to your $499 (or more) iPad. Still, if you do go the electronic route when tallying up the outs and runs of a baseball game, the iPad proves to be a much friendlier option than the iPhone. And iScore on the iPad is a solid choice, particularly for the detail-obsessed scorekeepers in the grandstand.